A schedule for the Cortland Theater. Dairy farmer Sivert Peterson built this house at 124 Precita in 1866. 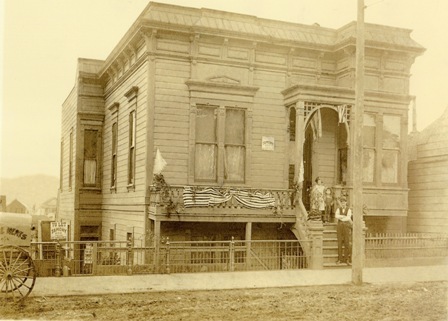 South San Francisco resident Gloria Wiegner Lane has done extensive research into this house at 440 Cortland, which her father grew up in. This building stood where Good Life Grocery is today. Clement Richardson and Bridget Mary Sheehan married in 1874 and had six children when they moved into the house at 440 Cortland Avenue in 1887 (three more were born later). Clement, a roustabout on the docks, was killed in an accident in 1897; aided by several of her children, Bridget ran a coal yard at 3501 Mission Street while taking in boarders. By that time she was 44, with eight of her nine children still living at home. In 1902, Bridget and Clement's son George opened Bernal Meats at 448 Cortland Avenue; later, his younger brother Walter helped with this enterprise, which flourished for 25 years. In the photo below, dated 1909, son Bill Richardson can be seen with two of Bridget's grandchildren, Florence and Melvin Wiegner. The bunting was to honor the citywide Portola Festival, which celebrated San Francisco's renaissance from ruin after the earthquake. According to the 1903 telephone directory, the Bernal Market was located at 440 Cortland, with the same phone number as George Richardson.